The Junkers Ju 88 was a German World War II Luftwaffe twin-engined multirole combat aircraft. Designed by Junkers Flugzeug- und Motorenwerke (JFM) in the mid-1930s to be a so-called Schnellbomber ("fast bomber") which would be too fast for any of the fighters of its era to intercept, it suffered from a number of technical problems during the later stages of its development and early operational roles, but became one of the most versatile combat aircraft of the war. Like a number of other Luftwaffe bombers, it was used successfully as a bomber, dive bomber, night fighter, torpedo bomber, reconnaissance aircraft, heavy fighter and even, during the closing stages of the conflict in Europe, as a flying bomb. Despite its protracted development, the aircraft became one of the Luftwaffe's most important assets. The assembly line ran constantly from 1936 to 1945, and more than 16,000 Ju 88s were built in dozens of variants, more than any other twin-engine German aircraft of the period. 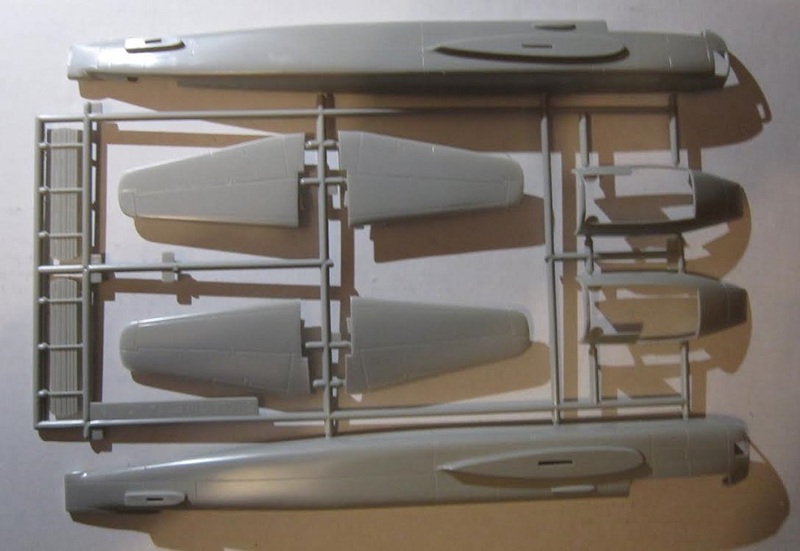 Throughout the production, the basic structure of the aircraft remained unchanged. The Ju 88 A-4 was an improved variant. Longer wingspan, due to redesigned wingtips. Stronger defensive armament. Power provided by Jumo 211 J-1 or J-2 engines (1410 hp)driving wooden bladed propellers. Reinforced undercarriage. 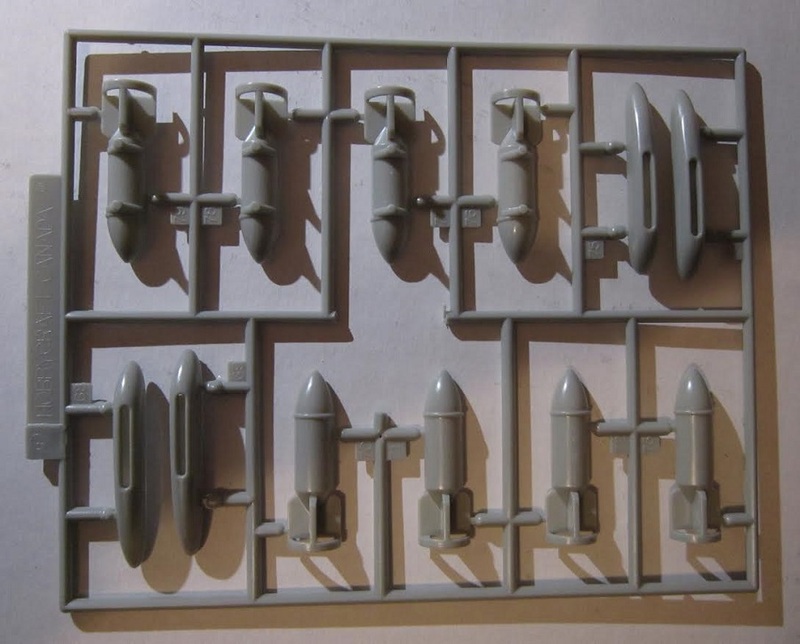 Provision for four external bomb racks. Hobby Craft of Canada is based in Ontario, Canada. 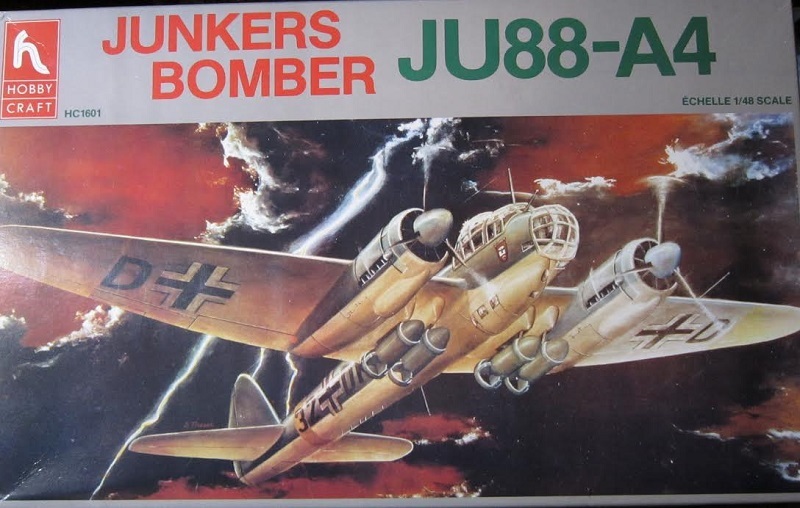 The box art shows a Ju-88A-4 flying through clouds and lightning flashes at night. It is in a splinter pattern of RLM 70 black-green and RLM 71 dark-green over RLM 65 light-blue undercarraige. Underneath the wings the tips are yellow. 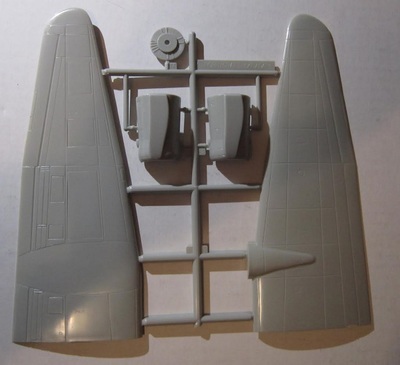 It has a yellow fuselage band. 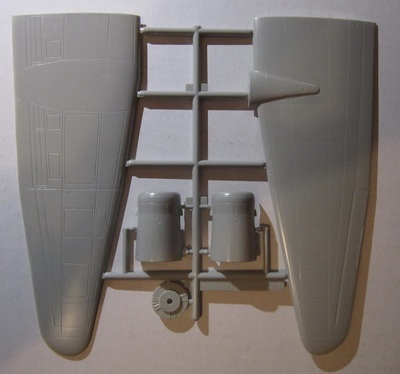 The fuselage code is black 3Z + red D black K. It has a red shield with a white square on it that has a black eagle on it on the sides of the nose. A large black letter D is below each wing. Hobby Craft in Concord, Ontario, Canada. Markings on box may differ from contents." This is followed by a short paragraph history of the plane in English and French and a small color repeat of the box art. The other side panel repeats those 3 things, but the history is in Italian and German. This kit contains 5 medium-grey parts trees and a clear parts tree in 2 sealed cello bags, the decal sheet and the instructions. The instructions consist of a single sheet that accordion-folds out into 8 pages in 7 3/4" x 10 1/4" page format. Page 1 of the instructions begins with a black and white repeat of the box art, followed byu the history of the Ju-88A-4 in Italian.German and English. Across page 2 through 4 is a 4-view of the box art scheme. Page 5 through 8 give a grand total of 10 assembly steps. There are no parts trees illustratioins in the instructions. However, the parts trees are alphabetized and numbered. ​There is no letter E parts tree. A modeling friend sent me a large line-drawing 3-view of the Ju-88a-4 years ago with specifications included on it. I have this line-drawing rolled-up in the box for future reference when I build the plane. 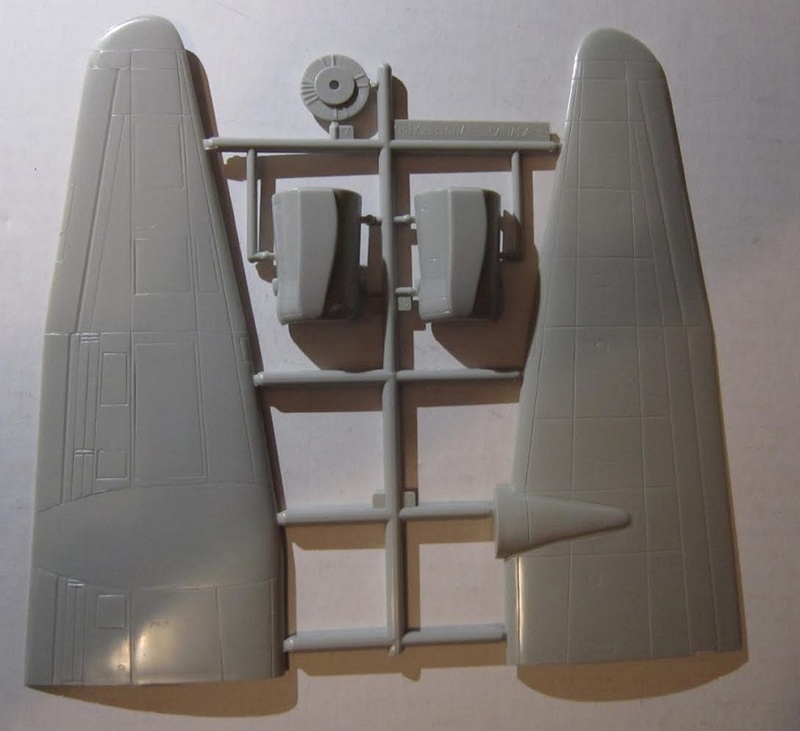 I also got a tan resin Mistel nose to turn the 88 into the bottom half of that flying bomb combination with a fighter on it's back. 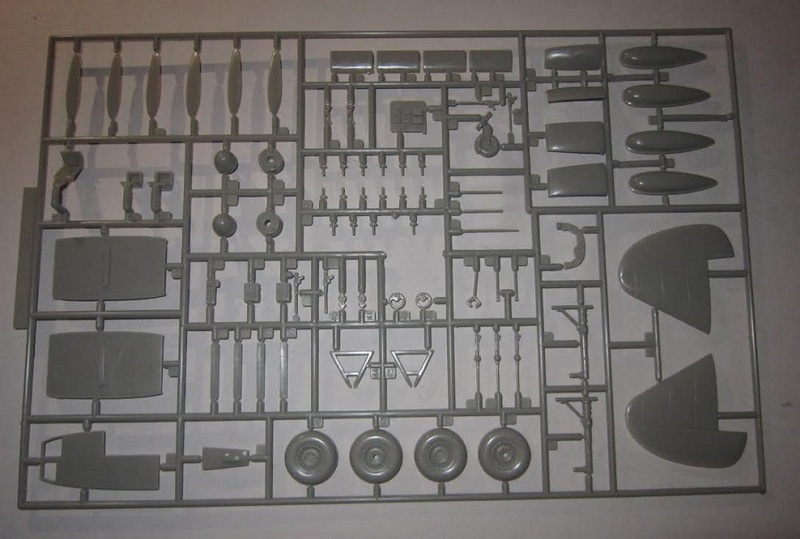 However, I also have the DML 1/48th scale kit of the Mistel somewhere in my stash. 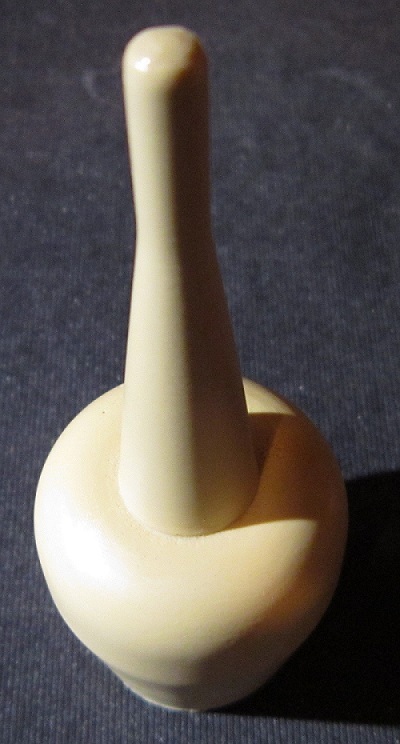 Jeff Roberts, who owns Roberts Models made this resin nose and gifted me it. 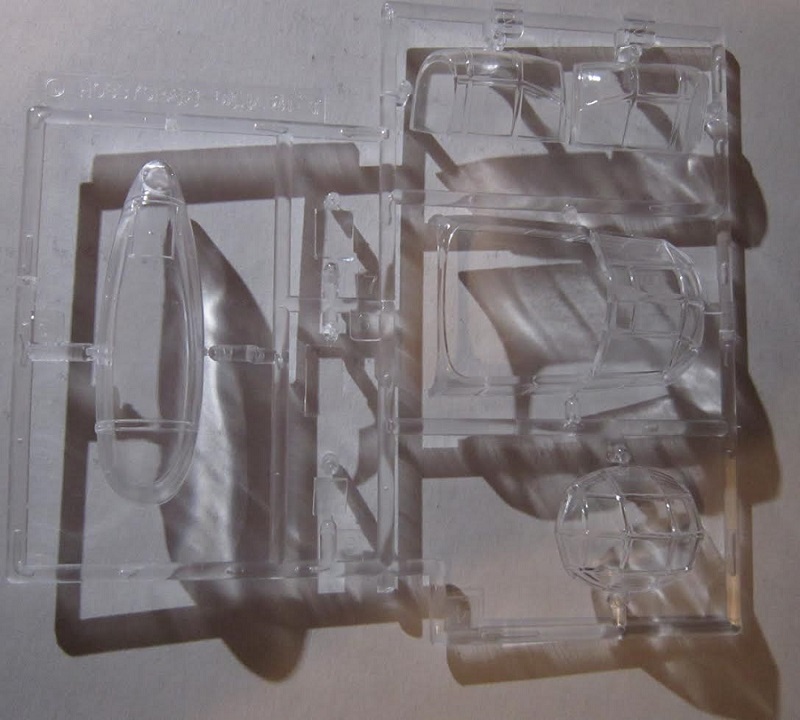 His company makes vacuformed aircraft models and resin accessories. I recommend this kit. I bought my kit at a local hobby shop back in the 90's (kit has a copyright date of 1990). The proprietor died of cancer and his wife discounted all the kits before closing the store. I got my kit for $25.00.